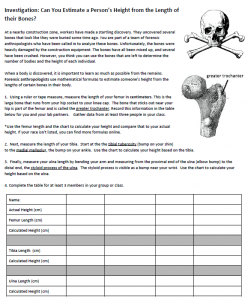 In this activity, students use tape measures to estimate the length of their femur, ulna, and tibia. These lengths are then with an equation to estimate their height which can then be prepared to their actual height. The instructions include terminology specific to those bones, such as greater trochanter, styloid process, and tibial tuberosity. I use this activity as an introduction to the lab where students examine real bones of a disarticulated skeleton. They can use the same formulas to estimate the size of the skeletons in the lab. The second part of this worksheet provides measurements from bones found at a construction site. Students use the same formulas to determine if the bones came from the same person or if there were multiple bodies at the construction sites. is it hard knowing your height with just your bones?